Where: Huron Hills Church, located between Huron Parkway & Green Rd. Identity: Is this really happening to me? Session 7: Relating, dating, mating-? Divorce is an intensely personal and uniquely painful experience for each individual. But we encourage you not to go through this alone: There are clear benefits to working through this difficult time with other, caring peers. First and foremost, our Divorce Recovery Workshop accepts you exactly as you are, where you are, today. We want you to know that you are not alone. We want to provide a place for you to connect, process your feelings, and rebuild your life as YOUwould like it to be. If you are in need, you are welcome here! Perhaps you are at the very beginning of the process; or maybe your divorce has been final for some time, but you still don’t feel like you are moving on. You’d like some tools to give you control of your situation. You’d like to talk and be heard. You’d like to experience forgiveness, hope and healing, as you go forward. The presentations given are built on sound psychological principles, and the premise that you can actually grow through the process of divorce. Our format combines professional talks given by a retired social worker, coupled with small-group discussions led by individuals who have themselves grown through their own divorces. Sessions are designed to meet the needs of those who are adjusting to the finality of a broken marriage(although your divorce may not be final), rather than those who are dealing with the possibility of reconciliation. 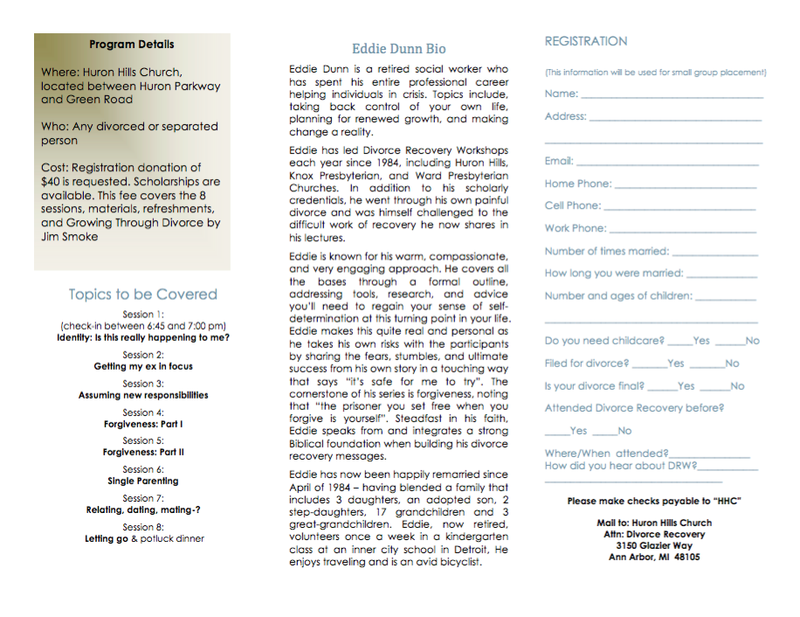 This Divorce Recovery Workshop is open to individuals of any and all faiths. Eddie Dunn is a retired social worker who has spent his entire professional career helping individuals in crisis. Topics include, taking back control of your own life, planning for renewed growth, and making change a reality. Eddie has led Divorce Recovery Workshops each year since 1984, including Huron Hills, Knox Presbyterian, and Ward Presbyterian Churches. In addition to his scholarly credentials, he went through his own painful divorce and was himself challenged to the difficult work of recovery he now shares in his lectures. Eddie is known for his warm, compassionate, and very engaging approach. He covers all the bases through a formal outline, addressing tools, research, and advice you’ll need to regain your sense of self-determination at this turning point in your life. Eddie makes this quite real and personal as he takes his own risks with the participants by sharing the fears, stumbles, and ultimate success from his own story in a touching way that says “it’s safe for me to try”. The cornerstone of his series is forgiveness, noting that “the prisoner you set free when you forgive is yourself”. Steadfast in his faith, Eddie speaks from and integrates a strong Biblical foundation when building his divorce recovery messages. Eddie has now been happily remarried since April of 1984 – having blended a family that includes 3 daughters, an adopted son, 2 step-daughters, 17 grandchildren and 3 great-grandchildren. Eddie, now retired, volunteers once a week in a kindergarten class at an inner city school in Detroit, He enjoys traveling and is an avid bicyclist.